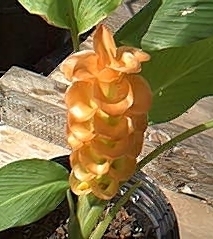 An unusually beautiful ginger is the CURCUMA ROSCOEANA or 'Jewel of Burma' Ginger. The inflorescence is a striking pure orange with a diamond-dusted texture. It literally glitters when in the sun! Although I live in Southeast Louisiana which is Zone 9b, I grow a lot of gingers that are hardy to Zone 7 with heavy mulch. Although very tropical and delicate-looking, most gingers are hardy and can take a lot of abuse. Just about every ginger also makes a wonderful container plant, which is ideal if you live where it freezes. Most folks order gingers from the southern states and receive their plants or rhizomes via the mail. I don't recommend that you buy ginger seeds. It takes YEARS to grow them large enough to see them bloom. Read on for a few growing tips. When you receive a ginger rhizome, remember that the soil temperature of the ground should be at least 55º F. for optimum GROWING results, otherwise keep the rhizome stored in a dry, cool place (but don't let the rhizome freeze) until soil temperatures above 55º F. are present. Carefully unpack your ginger rhizome. Position the "eyes" or new shoots of your rhizome in an upward position either in a pot or in the ground. Then cover your rhizome with a well-drained soil mix about 1" deep in a pot 3 - 4 inches larger than width of your rhizome. Or, you can plant your rhizome directly in the ground into well-drained soil about 1" deep. The ideal pH of soil mix is 5 to 7. Initially, water the soil thoroughly. Then do not water again until the soil is dry. If the rhizome is kept too wet, it may rot ---especially until it resumes full growth. Thereafter, keep the soil evenly moist but not wet. If planted in pot, place the pot with your rhizome in a sunny, warm area initially. After the leaves appear, place the pot containing your plant in appropriate light conditions according to each ginger species. When new leaves emerge, you can transplant your ginger to any well-drained loose, rich soil directly into the ground or you can leave it in the same pot. Upon receipt of a bareroot growing plant, the soil temperatures should be above 55º F. in order to sustain good growth. 60º F. to 70º F. soil temperatures are even better. Carefully unwrap and plant your ginger in loose soil at the same level it was growing before you received it. (You can usually tell by the markings on the stem.) You may plant your ginger directly into the ground or in a pot. Water thoroughly initially and thereafter keep the soil evenly moist but not wet. Any good dry fertilizer, such as (8-4-6), can be worked into the soil but keep it away from the rhizome. Gingers like plenty of water and fertilizer during the growing season. Before long you will be enjoying the beautiful blooms of your ginger. One of my favorite gingers is the WHITE BUTTERFLY GINGER. 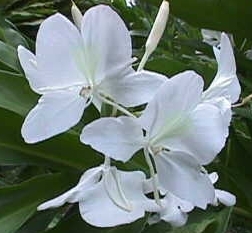 The botanical name of WHITE BUTTERFLY ginger is [Hedychium coronarium] and this pure white beauty is the most fragrant of all gingers. It's sweet, tropical perfume can lure you to it from a great distance. I currently grow 43 varieties of ginger. If you would like to view my photos, please use the link below. Please remember, these photos are copyrited. You are welcome to look, but please don't take them without written permission from me. Thanks! Please advise if you find any broken links on this website. It would be much appreciated! You can e-mail me at the link below.